M. Wolf discovered asteroid #874 Rotraut. V. Albitzkij discovered asteroid #1030 Vitja. US Army Air Corps Lt. James "Jimmy" Doolittle flew the first "outside" loop over McCook Field, near Dayton, Ohio in a Curtiss P-1B Hawk. Some scientists had predicted outside loops (inverted loops) would be fatal. C. Jackson discovered asteroid #1244 Deira. C. Jackson discovered asteroid #1393 Sofala. President John F. Kennedy made a speech before Congress urging the US to fly a man to the Moon. President John F. Kennedy started the US Lunar landing program in his second State of the Union Message before Congress, saying, "I believe this nation should commit itself to achieving the goal, before this decade is out, of landing a man on the Moon and returning him safely to Earth..."
Following Gagarin's flight and the Bay of Pigs failure, Kennedy announced the objective of landing an American on the Moon by end of the decade. In his second State of the Union Message, President Kennedy said: "With the advice of the Vice President, who is Chairman of the National Space Council, we have examined where we (United States) are strong and where we are not, where we may succeed and where we may not. . . . Now is the time to take longer strides - time for a great new American enterprise - time for this Nation to take a clearly leading role in space achievement which in many ways may hold the key to our future on Earth." President Kennedy set forth an accelerated space program based upon the long-range national goals of landing a man on the Moon and returning him safely to Earth; early development of the Rover nuclear rocket; speeding up the use of Earth satellites for worldwide communications; and providing "at the earliest possible time a satellite system for worldwide weather observation." An additional $549 million was requested for NASA over the new administration March budget requests; $62 million was requested for the Department of Defense for starting development of a solid-propellant booster of the Nova class. NASA launched X-15A Mach 5, SAS, Aero Test mission # 37 in which civilian pilot Joe Walker achieved a maximum speed of 5322 kph (Mach 4.95) and a maximum altitude of 32.766 km. NASA launched the Pegasus 2 meteoroid detection satellite. Pegasus 2 was a meteoroid detection satellite launched 25 May 1965. 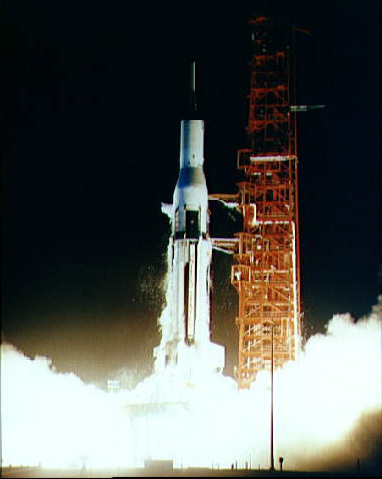 The Saturn I launch vehicle (SA-8) placed the spacecraft, protected by a boilerplate Apollo Model 4 CSM (BP-26), into a 740-by-509-km (460-by-316-mi) orbit. Once in orbit, the dummy CSM was jettisoned. Pegasus 2, still attached to the second stage of the launch vehicle, then deployed its 29-m (96-ft) winglike panels. Within several hours, the device began registering meteoroid hits. NASA launched X-15A IFDS/MIT/RAS Mod Technology/Test mission # 133 in which Air Force pilot Milt Thompson reached a maximum speed of 5501 kph (Mach 4.87) and a maximum altitude of 54.803 km. NASA rolled the first full-scale Apollo Saturn V launch vehicle out of the Vehicle Assembly Building. AS-500-F, the Pathfinder first full-scale Apollo Saturn V launch vehicle and spacecraft combination, was rolled out from Kennedy Space Center's Vehicle Assembly Building to the launch pad, for use in verifying launch facilities, training crews, and developing test procedures. The 111-meter, 227,000-kilogram vehicle was moved by a diesel-powered steel-link-tread crawler-transporter exactly five years after President John F. Kennedy asked the United States to commit itself to a manned Lunar landing within the decade. Meanwhile, the schedule for Saturn V was threatened by continued problems in development of the S-II stage (inability to get sustained 350 second burns without instrumentation failures, shutoffs, minor explosions). NASA launched Explorer 32 (Atmosphere Explorer-B) from Cape Kennedy, Florida, an aeronomy satellite designed to directly measure temperatures, composition, densities, and pressures in the upper atmosphere on a global basis. NASA launched the Skylab 2 (CSM 116, AS 206) mission, almost identical to the Command and Service Module used for Apollo missions to the Moon, bringing the first crew to the Skylab space station. USSR launched Cosmos 911 into orbit as part of a 6-satellite Soviet military navigation system. USSR launched Cosmos 1369 from Plesetsk, a third generation, high resolution Soviet photo surveillance satellite, "for investigation of the natural resources of the Earth." USSR launched Resurs F-01 for investigation of the Earth's natural resources. The satellite carried two passive separable 'Pion' probes to investigate upper atmospheric density, which it relased into independent orbits. Russia launched the Gorizont 32 communications satellite from Baikonu, positioned in geosynchronous orbit at 53 deg E in 1996-1999. Russia launched Progress M-49 from Baikonur to the International Space Station, an unmanned resupply vessel. The HiRISE camera on NASA's Mars Reconnaissance Orbiter photographed the Phoenix lander during its parachute descent to Vastitas Borealis. NASA's Phoenix lander touched down on Mars in the north polar region for a nominal 90 day mission.